This name uses Spanish naming customs: the first or paternal family name is Padovani and the second or maternal family name is Galarraga. Andrés José Padovani Galarraga (Spanish: [anˈdɾez ɣalaˈraɣa]; born June 18, 1961) is a former Major League Baseball first baseman who played for the Montreal Expos (1985–1991 and 2002), St. Louis Cardinals (1992), Colorado Rockies (1993–1997), Atlanta Braves (1998–2000), Texas Rangers (2001), San Francisco Giants (2001 and 2003) and Anaheim Angels (2004). He batted and threw right-handed. At six-foot-three and 235 pounds (1.91 m, 117 kg), Galarraga began his professional career in Venezuela at the age of 16. Despite several injuries that plagued Galarraga throughout his career, he was a very popular player both for his achievements on the field, and for his big and bright smile. He was nicknamed The Big Cat (textually translated from English as El Gran Gato, although his nickname in his native Venezuela was El Gato) for his extraordinary quickness at first base in spite of his big frame. Galarraga was a five time All-Star, won two National League Gold Glove Awards and two NL Silver Slugger Awards, and won the MLB Comeback Player of the Year Award after his successful return to baseball following cancer treatment. Galarraga was signed by the Leones del Caracas club as a catcher and third baseman. He made his debut in the 1978–1979 season. Some of the players he had as teammates included big-leaguers Tony Armas, Bo Díaz, Manny Trillo, Gonzalo Márquez and Leo Hernández. Galarraga originally started as a utility player, but three seasons later he became the regular first baseman of the team. At the recommendation of team manager Felipe Alou, he was signed by the Expos in 1979. At that time, some MLB scouts thought that the 17-year-old power-hitting prodigy was too overweight to play professionally. In the minors, Galarraga played for West Palm Beach (1979, 1982–1983), Calgary (1979–1980), Jamestown (1981), Jacksonville (1984) and Indianapolis (1985). Galarraga earned the Montreal job by being named Double-A Southern League Most Valuable Player for Jacksonville in 1984, with .289 batting average, 27 home runs and 87 RBI. He also led the league in total bases (271), slugging percentage (.508), intentional base on balls (10), hit by pitches (9), and in double plays (130) and total chances (1428) on first base. Prior to his majors promotion, he hit .269, 25, 85 with Indianapolis in 121 games, being named Rookie of the Year in the Triple-A International League. The Big Cat made his debut with Montreal on August 23, 1985. That year Galarraga struggled, hitting .187 (14-for-75) with two homers and four RBI in 24 games. He had a promising start in 1986, but it was halted when he suffered a knee injury. Galarraga had eight home runs and was leading all NL rookies in runs batted in (25) when he suffered the knee injury. Galarraga received arthroscopic surgery on the knee on July 10. He was activated one month later, only to be re-injured the following day after pulling muscles in his rib cage. He returned to action in September, ending with .271, 10 HR, and 42 RBI in 105 games. Overshadowed by some teammates, Galarraga survived a tough rookie year and quietly enjoyed a consistently strong 1987 season. He hit .305, 13 HR, 90 RBI, finishing second in the league in doubles (40). Despite his size, he displayed solid defense, being adept at scooping throws out of the dirt and excellent quickness turning the 3-6-3 double play. Cardinals' manager Whitey Herzog called him "the best-fielding right-handed first baseman I've seen since Gil Hodges." In 1988, Galarraga emerged from the shadows to become the best player on the Expos. He had an MVP-type season with a .302 batting average, 99 runs, 92 RBI, and 29 home runs. He also led the league in hits (184) and doubles (42), and earned an All-Star berth for the first time in his career. He was named the Montreal Expos Player of the Year at the end of the season. 1989 was a rough season however for the Big Cat. Galarraga became a target of Montreal fans' frustration when he tailed off after the All-Star game. That year he led the league in strikeouts (158), dropping his production to .257, 23 HR, and 85 RBI. He fell five RBI short of becoming the first Expo to string together three straight seasons with 90 or more runs batted in. Despite the rough season, Galarraga blasted his first grand slam, stole home for the first time in his career, and was rewarded with a Gold Glove Award for his stellar play at first base. Galarraga's 1990 season had Expos mumbling that the team should lower its expectations for the slick-fielding first baseman. For the second consecutive season, the Big Cat failed to repeat the standards he set in his first two full seasons. He hit .256 with 20 home runs and 87 RBI, almost a mirror image of his previous season. For the third consecutive year, he led the league in strikeouts. Pitchers exploited his impatience at the plate and didn't give him good pitches to hit. Even without any improvement with the bat, Galarraga continued to make tremendous contributions on the field, scooping up infielder's errant throws, starting 3-6-3 double plays, and winning his second Gold Glove. That season he also had a six-RBI game, two four-RBI games, and hit his first career inside-the-park homer. Slowed by injuries, Galarraga struggled through the worst offensive season of his career in 1991. Disabled with a strained left hamstring between May and July, he later had arthroscopic surgery to repair damage to undersurface of his left kneecap. Montreal missed his glove as much as his bat, committing 43 infield errors in 53 games without him. That season, Galarraga hit .219, 9 HR, and 33 RBI in 107 games. He stole home for the second time in his career and hit his 100th career home run. At the end of the season, he was traded to the Cardinals for starting pitcher Ken Hill. Galarraga had a second chance with St. Louis. Early in the year however, a pitch broke his wrist and he didn't recover until July. He batted .296 after the All-Star break and hit all ten of his homers after July 1 for a .497 second-half slugging percentage. He finished with a .243 BA and 39 RBI, but made a good impression on Cardinals batting coach Don Baylor. When Baylor became the first Rockies manager in the off-season, he recommended that Colorado take a chance on Galarraga and sign him as a free agent. The Big Cat was given new life for his career. In a 1993 season full of remarkable individual achievements, Galarraga showed he was an accomplished hitter, and flirted with the .400 mark for much of the season. His final .370 BA was a 127-point increase over his previous year mark. He led National League batters in batting average, and it was the highest average by a right-handed hitter since Joe DiMaggio batted .381 in 1939. Despite missing 42 games with assorted injuries, The Big Cat compiled 56 multi-hit games to lead the league. He added 22 homers, 98 RBI, 71 runs, 35 doubles, four triples, a .403 on-base percentage, and his .602 slugging percentage was second in the league. His .370 mark was the first player on an expansion team as well as the first Venezuelan to win a batting title. Tony Gwynn hit .358 to finish as runner-up in the title race. Galarraga's improvement began when Baylor drastically opened up his stance to make him quicker on inside pitches. The new stance also helped Galarraga generate more power to the opposite field. At the same time, facing the pitcher with two eyes gave him a better view at pitches, lowering his strikeout rate and making him much more consistent at the plate with better contact. Galarraga finished 10th in the MVP selection, but won The Sporting News Comeback Player of the Year Award. After the season, and for third time, he underwent arthroscopic knee surgery. In the strike shortened 1994 season, Galarraga set a new National League record in April by driving in 30 runs in a month. He seemed to be on his way to a terrific year again, but he fractured his right hand on July 28. At the time of his injury, Colorado had climbed to within a half-game of the first place Dodgers. Without him however, the Rockies went 3–10 the rest of the way. Galarraga paced the club with 31 homers (fifth in the league), and batted .319 with 85 RBI. On June 25, 1995, Galarraga hit a home run in three consecutive innings to tie an MLB record. He finished the season hitting .280, with 31 homers and 106 RBI. His numbers were helped by the fact that he stayed healthy for the first time in four years. That season, the Rockies had four players with 30 or more home runs, matching the 1977 Dodgers. On August 29 of the same season, in a game against the Pittsburgh Pirates, Galarraga spoiled Paul Wagner's bid for a no-hitter by singling with two out in the ninth, the only hit Wagner would allow in defeating the Rockies 4–0. Over the next few seasons, Galarraga developed into one of the best RBI-men in baseball, driving in a combined 396 runs between 1996 and 1998 (150, 140, 121). In the same period, he batted .279, .303 and .318, with 31, 47, and 41 HRs. Some critics argued that his achievements were possible thanks to the thin-air, mile-high, hitter-friendly Coors Field, but Galarraga belted many homers on the road that traveled over 450 feet (140 m). During the 1997 season, he hit a mammoth home run off Kevin Brown; a grand slam that landed 20 rows deep in the upper deck at Marlins' Pro Player Stadium and was alternately measured at 573 and 529 feet (161 m). Previously, he smashed two homers in two games that traveled 455-foot (139 m) and 451-foot (137 m) respectively, totaling 1,435 feet (437 m), an average of 478 feet (146 m) each. The Rockies released him at the end of the season to make room at first base for prospect Todd Helton. At the time of his release, he was the club's all-time leader in home runs (172) and RBI (579). As a free agent, Galarraga signed a three-year contract with the Atlanta Braves. During his first season in Atlanta in 1998, Galarraga silenced his critics. He proved that he could still have great power production at lower altitudes, hitting .305 with 44 home runs and 121 RBI. This made Galarraga the first player in Major League history to hit 40 or more homers per season, in consecutive years, for two different teams. 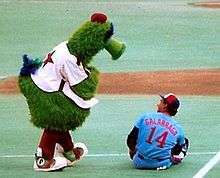 During 1999 spring training, Galarraga developed a sore back. Treatment from the team's trainers and team doctor included hydrobaths, massages, muscle relaxers, and stretching, but would not stop the nagging soreness. He was referred to a medical oncologist at Atlanta for a thorough physical exam and an MRI. When the diagnosis came in, the famous Galarraga smile disappeared. On his second lumbar vertebra in his lower back he had a tumor known as non-Hodgkin's lymphoma, a form of lymphatic cancer. He missed the entire 1999 season receiving cancer chemotherapy. Rockies third baseman and ex-teammate Vinny Castilla switched briefly from his traditional number 9 to number 14 on his jersey to honor Galarraga's cancer fight. Galarraga returned to the field in the spring of the year 2000 in high spirits and good shape after undergoing chemotherapy and a strict workout routine. In his third at-bat of opening day of the 2000 season, Galarraga knocked in the winning run with a home run, and he showed his big smile again. In April and May, he was tied for first place in home runs in the National League and he was batting .300. At the end of the season, Galarraga had batted .302 with 28 HRs and 100 RBIs. He was awarded his second National League Comeback Player of the Year Award by The Sporting News. Galarraga asked the Braves ownership for a two-year contract, but the most that it would offer was a one-year contract. Hence, Galarraga decided to become a free agent, and he signed with the Texas Rangers for two years. The change of baseball leagues affected Galarraga badly. At 40, he found himself "lost" in a different league, facing different pitchers, and stuck in a back-up position with the star Rafael Palmeiro as the main first baseman for the Rangers. Galarraga was used mainly as a designated hitter, as a pinch-hitter, and occasionally as a starter against left-handed pitchers. After a disappointing .235 batting average, 10 home runs, and 34 RBIs in 72 games, Galarraga was traded to the San Francisco Giants at the midseason. 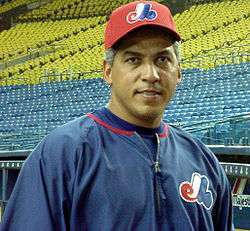 In 2002, Galarraga signed with the Montreal Expos for the full season. He then returned to the Giants in 2003 after he signed a minor league contract before the season. As a part-time player with the Giants, he batted .301 with 12 home runs and 42 RBIs. In 2004, Galarraga's cancer relapsed and he underwent two three-week periods of chemotherapy and was hospitalized for 23 days for additional treatment. This was the same Non-Hodgkin's lymphoma that sidelined him in 1999, but he beat it for the second time and began play with the Angels' Triple-A affiliate in Salt Lake. When rosters were expanded in September, Galarraga came back to the majors. Although he served mostly as a bench player in Anaheim, he was highly regarded in the clubhouse, especially among younger players such as Vladimir Guerrero, for whom he became a voice of experience. Galarraga saw action in a few games, and hit one homer to reach 399 for his career total. Again without a team, the New York Mets invited Galarraga to spring training, not knowing if the 43-year-old would be fit for their roster. Galarraga showed that he had some gas left in the tank offensively by socking 3 home runs, but appeared very tentative on the defensive end. Galarraga eventually retired during spring training on March 29, 2005, saying it was "the right time to give a younger guy a chance to play." He finished his career with a .288 batting average, 399 HR, and 1,425 RBI. Falling just one home run short of 400 career home runs, Galarraga ranked #36 all-time at the time of his retirement. Galarraga currently resides in West Palm Beach, Florida. Rockies Career Leader in At Bats per Home Runs with 15.5. His 150 RBI season in 1996 is still a single season record for the Rockies. 1 2 3 Eckhouse, Morris A. "The Ballplayers – Andrés Galarraga". BaseballLibrary.com. Archived from the original on 2007-10-17. Retrieved 2009-06-13.